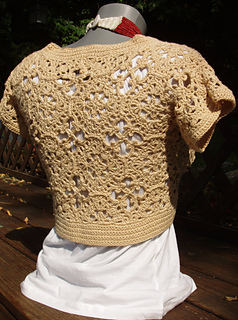 This pattern is from the book Blueprint Crochet which is available in print and eBook form. 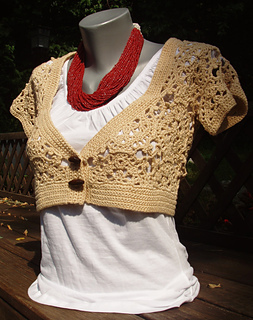 It is also available as a single pattern download from the Interweave Store. Shown: Oasis by South West Trading Company (100% soysilk; 240 yd 219.5 m/ 3.5 oz 100g): #57 Natural, 3,(3, 5, 5) hanks. Hook: H/8 (5.0mm) and F/5 (3.75mm) or hooks needed to obtain gauge. Notions: Tapestry needle; 2 (2, 3, 3) 1 ¼“ (32 mm) toggle buttons. bust circumference and 12 (13½, 16, 18)”, (30.5 34.5, 41, 46 cm) upper arm circumference. Bolero shown in size Medium.